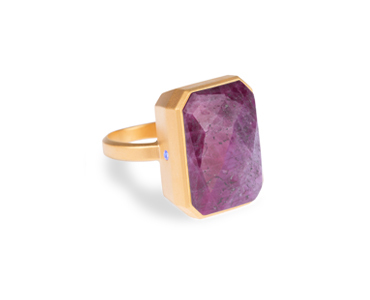 The jewellery and technology worlds have just met with new stylish oversized cocktail ring designs by Ringly. The luxurious pieces are constructed with an 18K matte gold 3 micron plated setting, impressively featuring precious and semi-precious stones. Available in several colour options including 'Rainbow Moonstone' and 'Black Onyx', the designs alone are beautiful - but they also have a unique technological feature that makes them more than just an accessory. 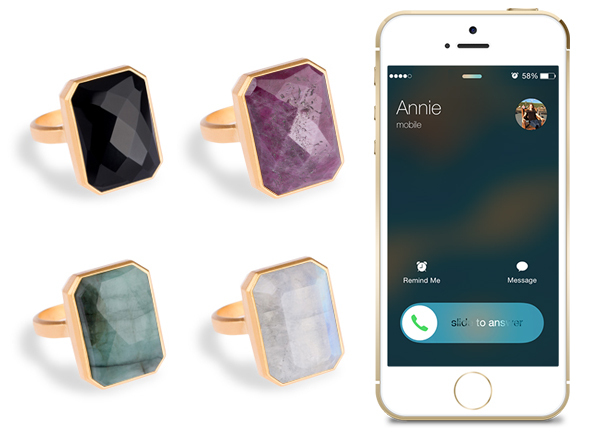 The rings are able to alert the wearer to any new phone notifications, allowing you to go hands-free and not have to check your phone constantly. The notifications are sent through vibrations and light, so the wearer always knows when there has been some activity on their phone. Connected to an app, the experience is customisable and you can select which notifications you wish to receive through the ring, personalising the entire experience - you can even pick individual contacts to be notified about. The cocktail rings are currently available for pre-order and haven't been released yet. There is even a limited edition design "crafted with a rhodium-tone plated setting and a tourmalated quartz semi-precious stone". Available for iOS and Android, users simply download the accompanying app to get started, selecting exactly what notifications they want to receive through the app's colourful and fun interface. The pieces are due for release in summer 2015 and have already caused a stir online, with many websites featuring the innovative and impressive design that successfully adds a fashionable twist to the tech world - could this be the fashionista's answer to the new Apple Watch?